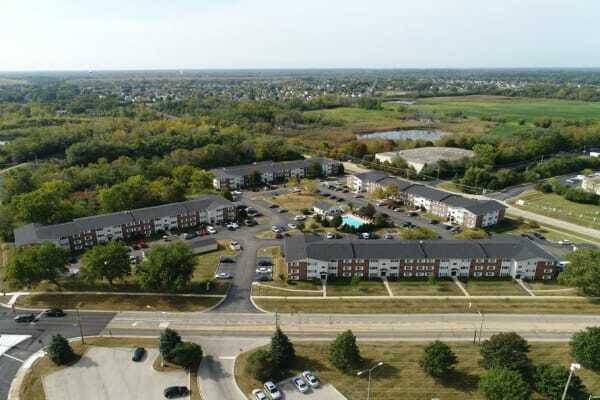 Residents at West Line Apartments enjoy an unbeatable location just 30 minutes west of Chicago. Those commuting to downtown or throughout the greater Chicago area will appreciate living next to the Hanover Park Metra Rail Station. When you need to take your own vehicle, we are right off of W Lake St, near the entrance to the Rte-390 Tollway. Hanover Park is in between Bloomingdale and Schaumburg, where you’ll find the Stratford Square Mall and Woodfield Mall, giving you numerous options for casual dining, shopping, and services just a few minutes from your front door. With an Ontarioville Road address, you’ll be moments away from the essential resources the neighborhood and Hanover Park provide, including close proximity to major employers such as Chiquita Factory and Menards. Getting around is easy from West Line Apartments, one of Hanover Park’s best apartment communities. The Hanover Park neighborhood is served by regional public transit, including Metra Trains and Pace bus service to The Loop and throughout the Chicago area. Our ideal location off W Lake St gives you direct access to major area expressways, making your commute to and from work as easy and stress-free as possible. Once you’re back home, you’ll appreciate the many neighborhood grocery stores that are a short drive from your West Line Apartments home, including ALDI, Dino’s Finer Foods, and Tony’s Fresh Market. Kids, dog owners, and everyone in-between love Ontarioville Park, a five-minute walk from home. For more recreation options, we recommend you head to the Hanover Park Community Center, a sports center with swimming pool, sport courts, and large open fields.